This trio of selections from another memorable Sunday-night party at The Ear Inn (326 Spring Street, Soho, New York City) reminds us again of a great band’s ability to move freely around in a variety of tempos, and of the beauties of melodic improvisation. Tempo: in the last thirty years, the speed at which familiar jazz material is approached has steadily accelerated, until (to my ears) some groups have only two speeds, Fast and Faster (with an occasional ballad or slithering mood piece / blues). The EarRegulars are intimately familiar with the glories of Medium Tempo and Rhythm Ballads. Melody: although the musicians may chat delightedly about the harmonic feats of daring accomplished during a solo, most of us warm to the sweet melodies we know. This doesn’t mean that they have to be replicated precisely according to the sheet music, but it does mean that BODY AND SOUL, for example, is more than a shift from one key center to another. That’s enough aesthetic sermonizing for anyone. To the music — which proves once again that classic standards still have enough resilience to be fascinating material for improvisers in this century — three songs written before Franklin D. Roosevelt’s first term. CATHERINE RUSSELL SWINGS IN (M)ANY LANGUAGE(S)! And when you put Catherine in front of a hot band — the evidence follows immediately! — the effect is happily seismic. 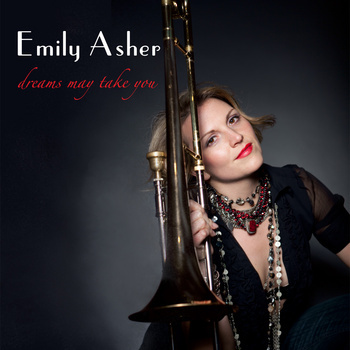 Here she is at the 22nd International Bohém Ragtime & Jazz Festival in Kecskemét, Hungary, singing EVERYBODY LOVES MY BABY (the arrangement is by Andy Farber and Attila Korb) with the Hungarian Bohém Ragtime Jazz Band . . . József Lebanov, trumpet; Attila Korb, trombone; Zoltán Mátrai, reeds; Tamás Ittzés, piano; György Mátrai, guitar; József Török, string bass; Alfréd Falusi, drums. Recorded March 23, 2013. More information: bohemragtime and catherinerussell. Here Catherine ventures into Hungarian melody and lyrics. True, she has to put on her glasses, but she does such a nice job — her singing comes from the heart! The band is almost the same, but Tamás Ittzés switches to violin, with Miklós Lázár alongside him. The song is “miért szerettem bele magába,” which I believe translates to WHY I FELL IN LOVE, and it’s a neat rhythm ballad. Can’t you hear Louis or Fats doing it, around 1936? (I am sure that one of my readers can tell us all more about this composition by Mihály Eisemann and László Szilágyi. And some wonderful swing dancing, too. Mért szerettem bele magába? Gondolkodom, de már hiába. Bármi rosszul esik, a szív beleesik egy ilyen kis hibába. Ki gondolta volna előre, hogy ez lesz a végén belőle? Máris odavagyok, majdnem belehalok, mi lesz ebből jövőre? E sok közül éppen magát kellett kifogni. Catherine Russell is a star — wherever we find her! And that reminds me. If you don’t see yourself as going to Hungary in the next two weeks, or you have mislaid your passport, swing relief is in sight. 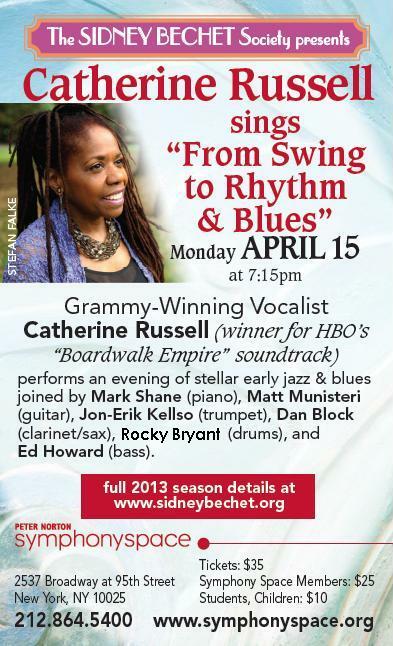 Catherine will be appearing with a beautifully hot band on Monday, April 15, 2013, at a concert given by the Sidney Bechet Society. That, as Keats said, is all you need to know. See you there!